We are back with another contribution to our fabric shopping series from cities around the world. Please welcome Michelle Casey Wyman who teaches quilting and embroidery as well as designs original quilts, pillows, and various textiles for the home. She is giving us a fabric shopping tour of of the San Francisco Bay Area in California. As a native of the San Francisco Bay Area I am thrilled to share my passion for textiles and some of my favorite resources for fabric and inspiration in this beautiful part of California. So hop on a plane, BART (Bay Area Rapid Transit), or a cable car and join me on this virtual tour. Unfortunately the small, independent fabric and quilting stores in the City have had to close as the booming tech industry has made rents prohibitive for many small businesses. However The Ribbonerie on Sacramento Street is a feast for the eyes and a great stop for garment sewers or crafters who are looking for ribbons and unique notions. The de Young Museum in Golden Gate Park has a rotating textile exhibition as well as a textile library for those of you who are textile scholars. Views of the City from the tower at the de Young are not to be missed. The arts and crafts scene, along with a vibrant food, music and theater culture continue to thrive in the surrounding areas of San Francisco. Take a trip across the Bay Bridge and head over to Stone Mountain and Daughter in Berkeley. Located on Shattuck Avenue since 1982, Stone Mountain and Daughter is owned by father/daughter team Bob and Susan Steinberg (translation: “Stone Mountain”). The Steinberg family established the business in Los Angeles over 100 years ago. Stone Mountain caters to the garment sewer as well as the quilter and has a niche in the import global textile market. Their import curator has long-standing connections globally and sources textiles from India, Japan, Africa, Mexico, and South America offering unique pieces for garments, quilts and home décor. Stone Mountain carries a large selection of patterns from indie designers for the garment sewer. Susan Steinberg is often seen on the floor helping customers and writes a resourceful as well as entertaining newsletter that is worth subscribing to. The newsletter usually includes generous discounts on fabric purchases building a strong support base of loyal customers in the community. 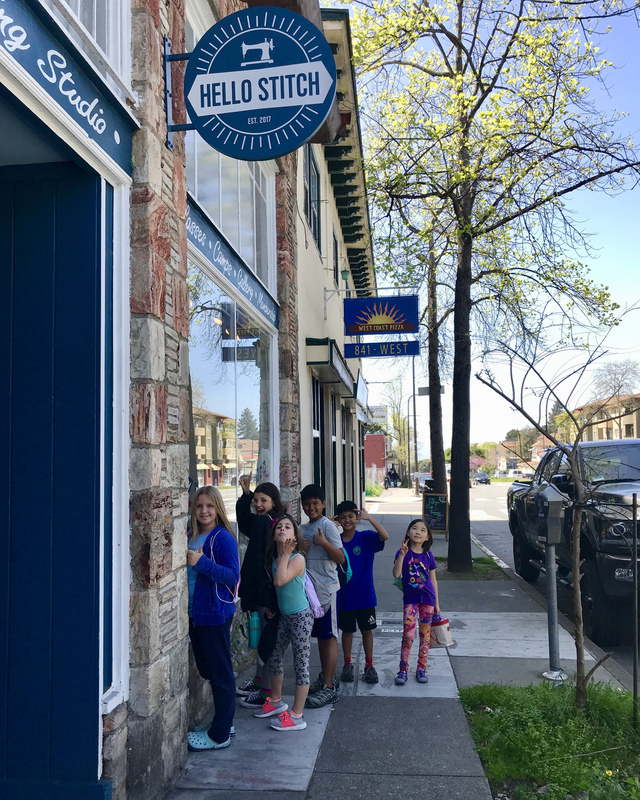 Speaking of community, not far from Stone Mountain is a growing business on University Avenue called Hello Stitch Studio. For the traveler looking for a place to sew you can drop in and retain a day pass for full access to sewing machines, design walls, ironing boards and various tools. Enjoy some inspiration from the quilts (or other fiber art textiles) on display on the gallery walls and take advantage of support and advice from the three knowledgeable owners. You might even be able to jump into a class or sign up for a workshop while you’re in town! 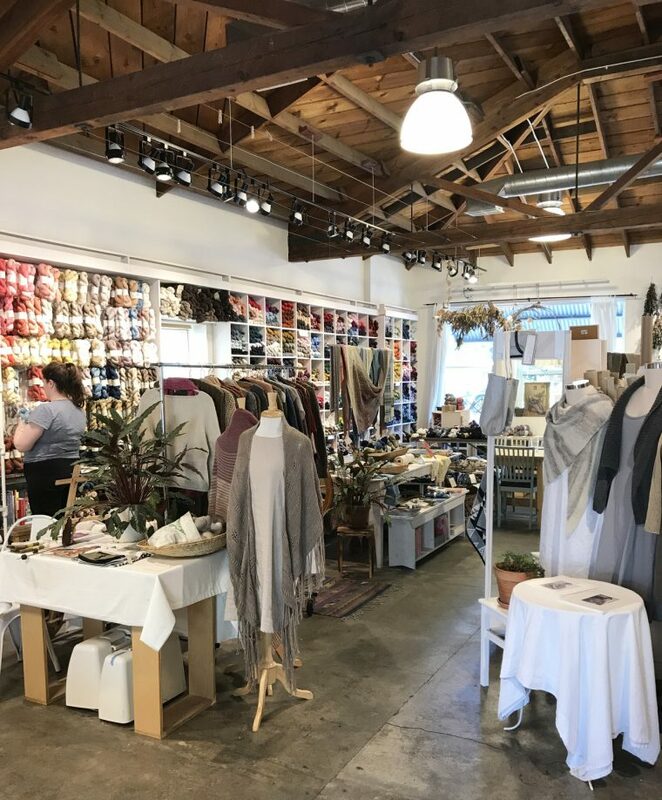 The neighboring city of Oakland has become a hot bed for textile artists, designers, independent shops and boutiques for fabric, notions, yarns, patterns and locally made clothing. One of my favorite shops and resources is A Verb For Keeping Warm located at 1628 San Pablo Ave. Owner Kristine Vejar is a textile scholar who studied dying, block printing and other surface design techniques in India. She is the author of The Modern Natural Dyer. Kristine and her partner Adrienne have created a store front next to the dye studio along with a small dye garden on the back patio. They have a beautifully curated selection of yarns, fabric, dye materials, patterns, notions and kits for the enthusiastic fiber fanatic as well as for the novice. Visit their website to find out more about upcoming workshops and classes offered by local artisans as well as master dyers and textile designers from all over the country. 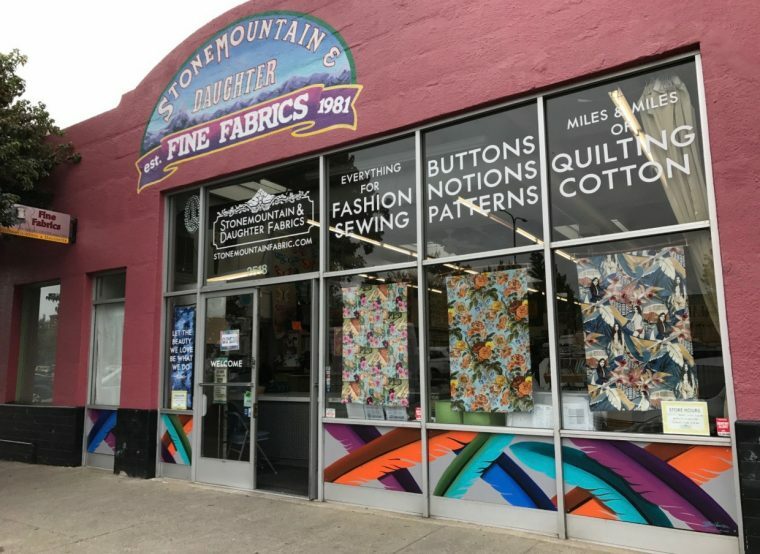 If you are looking for a small, independent fabric store in Oakland Piedmont Fabrics located at 4009 Piedmont Avenue and is open seven days a week. This little gem of a store is stocked with beautifully curated fabric from Liberty lawns to quilting cottons as well as some linens and home décor fabric. Owner Lan Nguyen is lovely and happy to share her expertise with locals and those visiting the area. Just up the street is a small sewing machine shop called Sew Images, a dealership for Bernina, Janome and Babylock sewing machines should you be traveling with your machine and need a part or special foot. Some of you may be thinking about heading to Craft Napa in January and if so you’ll want to make sure to stock up on fabric and supplies before you head on your way to the wine country. 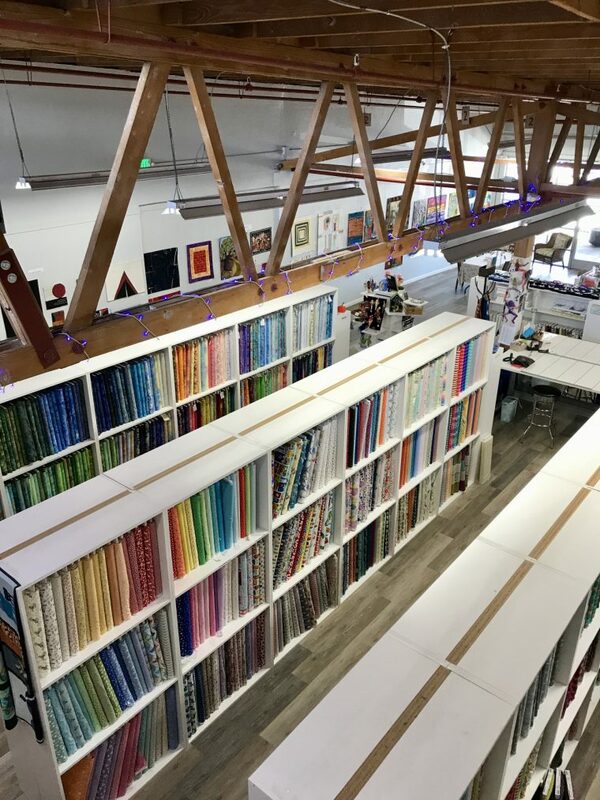 Just north of Berkeley in Richmond is a new beautiful shop called Bay Quilts with the largest selection of quilting cottons in the north bay. Mother/daughter owners Sally and Abbey Shane have transformed this large warehouse space into a gorgeous shop that accommodates hundreds of bolts on the main level along with a quilt gallery displaying a rotating exhibition of quilts from quilters and fiber artists from the region. The upper level is set up for on going classes and workshops as well as a studio space for a long arm quilter. Sally lends the quilting classroom space to several groups who meet there regularly, thus upholding the quilting bee tradition where a community of quilters can congregate. Sally also carries local hand dyed quilting cottons and silks, Japanese fabric, doll making supplies, patterns and notions. Bay Quilts is quickly becoming a favorite shop for local quilters and is now on the map for travelers from afar. Shops of note in the East Bay: New Pieces in Berkeley on Gilman Street. This quaint shop holds a good array of quilting cottons, rulers, books and supplies and has a classroom in the back. Discount Fabrics located on 3006 San Pablo Ave. in Berkeley. Low prices on an array of home decor and some garment fabrics as well as bins of notions all offered at bargain prices. If Silicon Valley is your destination and you “know the way to San Jose” a must see is the San Jose Museum of Quilts and Textiles. The museum is dedicated to the preservation and education of quilts and quilting traditions from around the globe. The museum houses rotating exhibitions and schedules on going lecturers from quilters and quilting experts. They have a small but wonderful museum store if you are in the shopping mode. Beyond the bay in Contra Costa County you will find three wonderful quilt shops I can highly recommend; The Cotton Patch in Lafayette. Some of you may know of Carolie Hensley’s shop from her pop up shops at Empty Spools Seminars in Pacific Grove, CA. Stop in to her shop in Lafayette if you are traveling east from Berkeley. Carolie has a great selection of fabric by local Bay Area designer Jennifer Sampou. Jennifer is also a fabulous teacher and hosts quilting retreats and classes. Hop on her website to learn more. Further down the highway in Walnut Creek on Mt. Diablo Blvd. is Monaluna a beautiful and inspirational fabric store housing designer Jennifer Moore’s organic quilting cottons as well as lawns and knits. Jennifer is dedicated to producing fabric from organically grown cotton; the best choice for the environment and my first choice when sewing for children. The feel of these organic fabrics is ultra soft and the designs appealing for garments as well as quilts. Last stop is Danville and the home of Wooden Gate Quilts, a gem of a shop with beautifully curated quilting cottons sourced by shop owner Gina Chang. Don’t forget Fabric Outlet at 2109 Mission in San Francisco’s Mission neighborhood. It’s BART-able and bus-able, and offers an astounding selection of beautiful fabrics for clothing, crafting, and home decor at low low prices. It’s THE destination for SF’s art school fashionistas. Thank you Cynthiaknits for including this store. I was focusing on independent stores that I have frequented but realize there would be one or two I have left out. 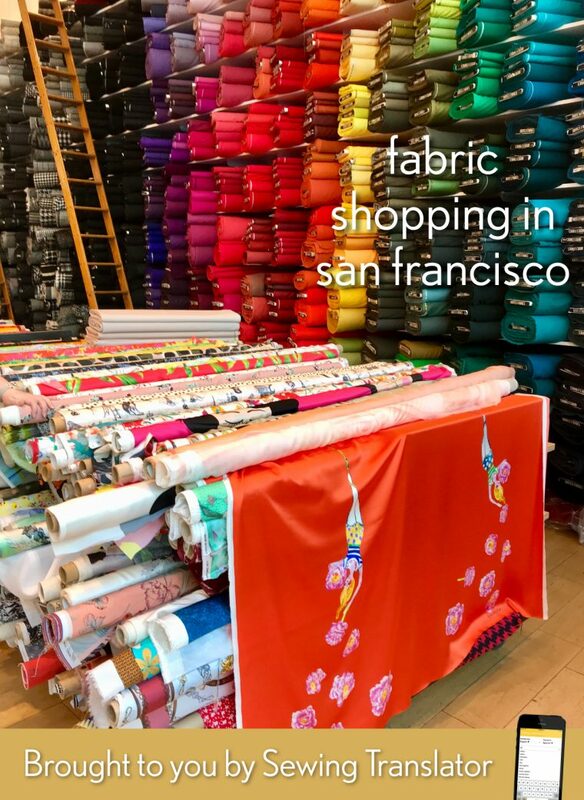 I appreciate your catching this oversight as Fabric Outlet sounds like a more affordable choice not only for SF art students but for all of us makers in the Bay. I will check it out! I agree that Fabric Outlet is great! Fabrix at 432 Clement is a wonderful grab bag. Thai Silks in Mountain View shouldn’t be missed. And, it’s in Santa Cruz, but Harts Fabric is totally worth the drive. Thanks for highlighting Hello Stitch Studio! We are so fortunate to be in such a wonderful community with so many great textile resources and artists! As a lifelong Bay Area resident, I learned about a few new places here and appreciated your references to the City, knowing the way to San Jose (I grew up there! ), and leaving one’s heart in San Francisco. As I’ve told many a bored listener, I have TRIED to leave the Bay Area, but I just don’t feel at home anywhere else. Must have left my heart in SF many years ago, and it still has it (tech bros on scooters notwithstanding). I lived in the Bay area for 20 years and now I own my own store (www,thequiltshop.cl) in Santiago, Chile. I know many of the stores posted here but I will keep this article in mind when I go back to visit. Thank you very much!!! Thousand Cranes on 4th street in Berkeley is also a great place to go for traditional Japanese cottons. A relatively small but beautiful selection. Thanks so much for the mention of the San Jose Museum of Quilts & Textiles! Your article is a great resource for us fiber fanatics! I realize Santa Cruz isn’t exactly San Francisco, but it does have a great little fabric store, Hart’s Fabric, which also sells fabrics online. I highly recommend a visit if you are in that area. Excelent article. Have been to many of the stores and can’t wait to check out the new ones.